Many years ago, when I was a student, an emminent, but possibly not-very-gifted surgeon said to me, once he had stopped sweating, “Any fool can get into trouble. It’s getting out of it that counts.” A fellow enthusiast, wishing to do a complete overhaul on his vintage Hezzanith sextant, broke a vital screw when it was only part of the way out. He couldn’t get the rest of it out, nor could he screw it back in, and in this condition, the micrometer of the sextant was useless. He sent me the index arm with attached micrometer mechanism to me from England, together with an A10-A bubble sextant frame with a seized index prism shaft, but that’s another story. 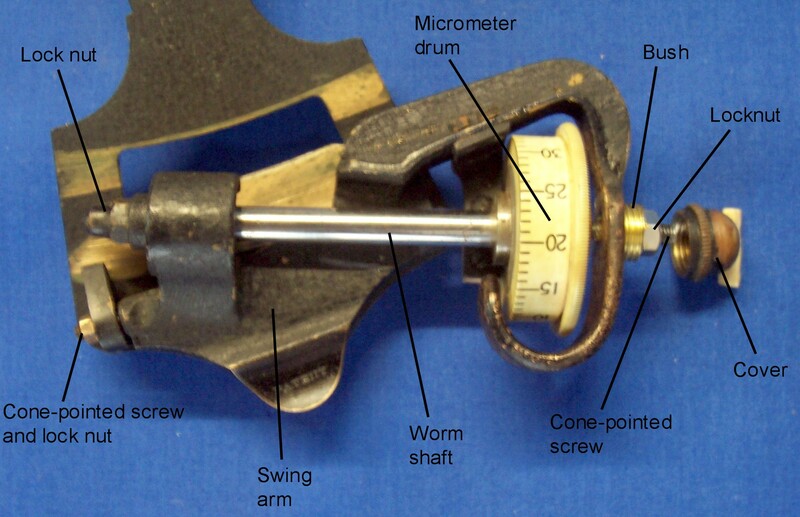 Heath and Co.’s sextants with their Hezzanith Endless Rapid Reader Automatic Clamp differ in several ways from most other micrometer sextants: the rack is cut on the back of the limb rather than on the edge; the worm is swung out of the plane of the limb when the release catch is operated, rather than in the plane of the limb; and the worm shaft runs between two screws, the 60 degree coned ends of which rest in the same centre holes on which the shaft rested when originally being turned. 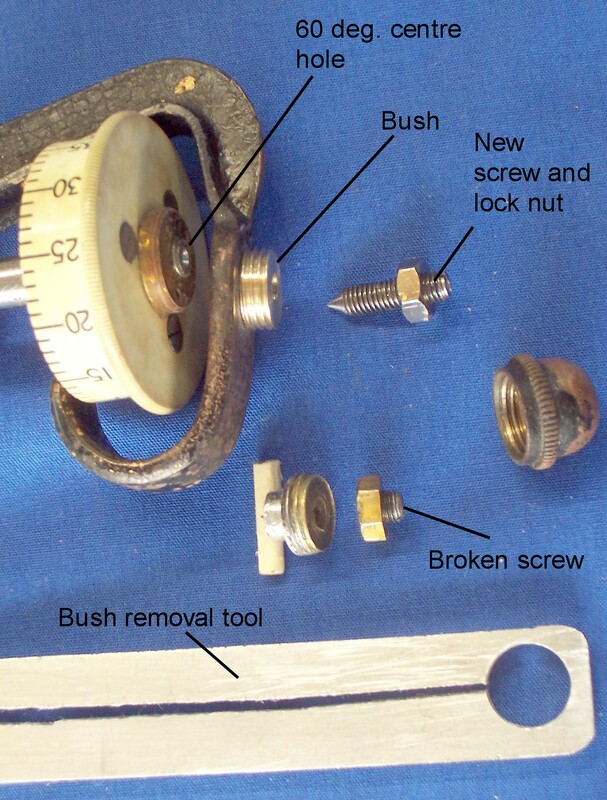 The screws have to be locked and a locknut is a simple way of doing this, though care has to be taken to check that the setting of the screw is not disturbed by tightening the nut. The chassis on which the worm shaft bearings are mounted, which I have chosen to call the swing arm since noone else seems to have given it a name at all, is also mounted between centres. Mounting a shaft between centres is a very good way of maintaining concentricity, the centres can be adjusted so that for practical purposes there is no unwanted play (looseness) in the bearings, and they are very cheap to produce. The centres cannot sustain a heavy load at high speed for any length of time, as any turner will bear witness, but in a sextant, parts are always lightly loaded and slow moving. Running centres are hardened. The following picture shows the layout I have just explained in a rear view of the index arm expansion. The hardening was the undoing of my friend’s sextant, since hardened parts have a tendency to crack, especially if they have sharp internal corners, as do screw threads. There are various ways of dealing with broken screws. If the other end is accessible and can be gripped in some way, it may be possible to back it out, but in this case, only the 60 degree point was projecting. If a hole can be drilled in the broken end, an easyout may be used. This is a tapered hardened tool with a coarse left hand thread that jams in the hole as it is screwed in, left-handed, and with luck then unscrews the offending broken screw; but in this case the screw was only 5/32 inch (3.96 mm) in diameter and anyway, it was hardened. For this reason too, it was not possible to try option 3, which is drill out at tapping size, leaving only the thread to remove with a tap. In desperation, one can trephine out the whole screw. A trephine is sort of tubular drill with cutting teeth on the business end. There are other methods not usually found in the home workshope, like spark erosion. As I have no small carbide drills, I elected to try to soften the screw prior to drilling it out, by heating it with a small blow lamp. As I did so, I noticed a bead of solder appearing, more or less at the same time that the local paint disappeared and it dawned on me that the screw was running in a brass bush that had been soldered into the bronze swing arm frame. If I could remove the bush, I could replace it with a new one and choose any size of thread that was close to the original for the cone-ended screw. I had no idea about the exact form of the bush until I had removed it, so thought it best to remove it undamaged. The bush resisted my initial blandishments so I made up a gripping tool that would spare my blistered finger tips. This sort of tool, seen below, is very good for gripping delicate objects that have to be unscrewed without damaging them, like telescope lenses and threaded parts. It can be made of fine-grained hard wood or soft metal and, as can be seen, for a tool that would be used only once, I wasted no time on precision and finish apart from getting the size of the hole correct. Back to the blowlamp and within minutes the bush was free. It then took only about twenty minutes to make a new one, identical to the old, except that the central hole was tapped 5/32 x 40 tpi instead of the original 48 tpi. It was the work of moments to solder it into the frame. A few more minutes saw the production of the cone-ended screw. The original had been hardened all through, the source of all the trouble. I hardened only the end and left the rest soft. I do not, by the way, undertake sextant repairs for gain, but people occasionally send me calls for help and post me bits of their sextants. I do my best to help them, especially if they have bought copies of my restoration manuals or my e-book, The Naked Nautical Sextant.